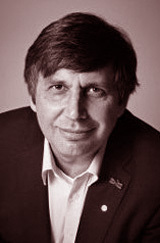 Andre Geim obtained an MSc from Moscow Physical-Technical Institute in 1982, and a PhD at the Institute of Solid State Physics, Chernogolovka, Russia, in 1987. He worked as a research scientist at the Institute for Microelectronics Technology, Chernogolovka, until 1990. Between 1990 and 1994 he was a postdoctoral fellow at the Universities of Nottingham, Bath and Copenhagen, and in 1994 he became Associate Professor at the University of Nijmegen in the Netherlands. In 2001 he moved to the UK to take up the position of Professor of Physics at the University of Manchester. Between 2007 and 2010 he was an EPSRC Senior Research Fellow. Since 2002 he has been Director of the Centre for Mesoscience and Nanotechnology at the University of Manchester; currently he is the Langworthy and Royal Society (2010 Anniversary) Research Professor of Physics at the University of Manchester. In addition to the Nobel Prize in 2010, he was awarded the Royal Society Hughes Medal and the John J. Carty Award from the US National Academy of Sciences for the discovery of graphene. In 2009 he won the Korber Prize, in 2008 the Europhysics Prize, and in 2007 the Mott Medal and Prize. He is a Fellow of the Royal Society and is Hon. Professor of Moscow Phys-Tech, Hon. Professor of the University of Nijmegen, Hon. Fellow of the Institute of Physics, Hon. Fellow of the Royal Society of Chemistry, Hon. Fellow of Singapore Institute of Physics, Hon. Professor of the Chinese Academy of Sciences. He was made a Knight Bachelor in the 2012 New Year Honours for services to science. The information on this page is based on content at Nobelprize.org © The Nobel Foundation and Andre Geim's home page at the University of Manchester.